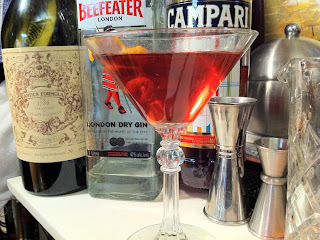 If there is one cocktail I've found myself coming back to over and over again, it has to be the legendary Negroni. The key to a great Negroni is using a good quality sweet vermouth. 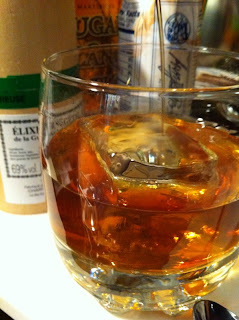 I prefer the Carpano formulas available here in the U.S. ("Punt e Mes" and "Antica") but I also enjoy Cinzano rosso. There are some good choices out there so feel free to experiment. 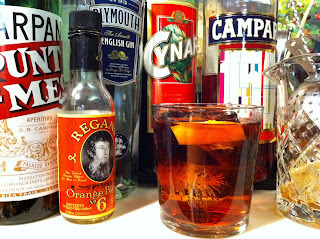 Most people agree though that the Carpano Antica in a Negroni is hard to beat. Whatever your choice, you can vastly improve any vermouth's shelf life by keeping them refrigerated and using smaller bottles whenever you can. I wouldn't necessarily call this a benchmark drink for gin tasting, but it's close. One thing I am certain of is that a good gin doesn't have to be expensive, especially for mixing cocktails. The old guard premiums that flourished before gins tried to compete with vodkas and be "ultra smooth" tend to excel. I prefer a quality, strong flavored gin like Bombay Dry or Beefeater regular over say a Bombay sapphire in most mixed drinks. 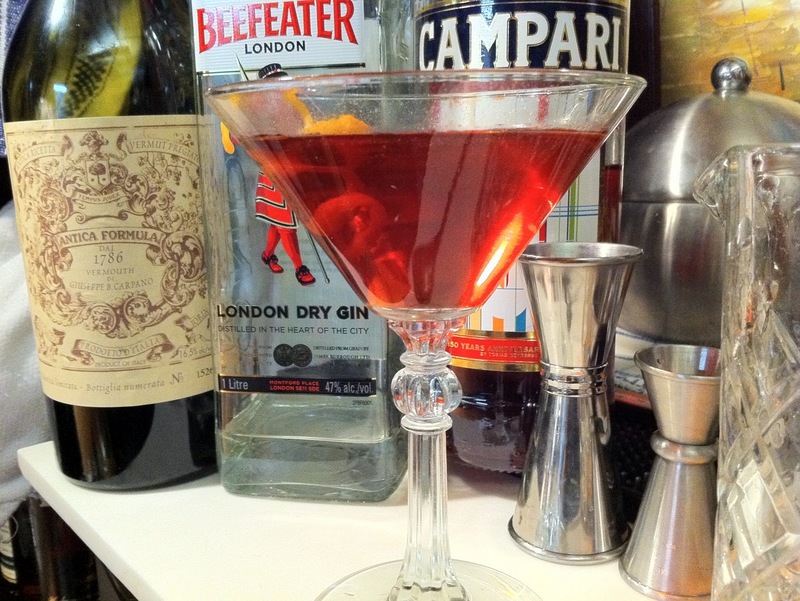 Using smoother gins like Plymouth can still be good, but they end up playing more of a supporting role to the Campari and vermouth rather than providing the structure and balance that the stronger flavored gins can provide. You can serve this one "up" or on the rocks. If you're feeling lazy, you can build it right in the glass. 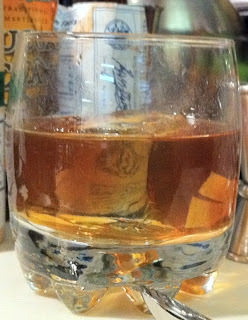 The dilution and extra chilling that the mixing glass treatment provides is well worth the extra effort (as usual). Tales have been coming from the punch bowl for quite a while now. Punch's humble beginnings in the seventeenth century sprang from "necessity" when it was consumed by bored agents of the empire in far off postings as a way to temper the strong "aqua vitae" (and also simply to pass the time). By using the sugar, citrus and spices that were readily available in India and the islands of the tropics they found that they could tame the raw spirits of the day into something that was more than merely palatable. It's had quite a journey over the last four to five centuries. It was once a ubiquitous and well practiced art but the pace of modern life eventually caught up with punch. 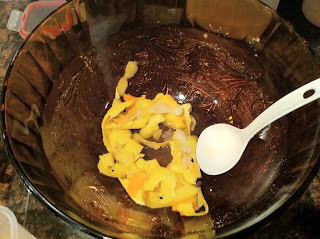 Most people simply didn't have the time to sit around and see a bowl through to the end. 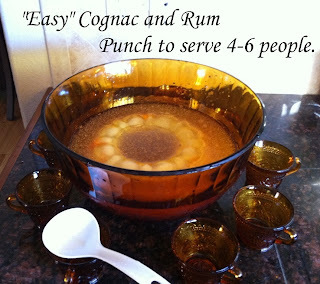 After recently reading David's"Punch" book, I was inspired to try my hand at one for the family's Thanksgiving feast this year. I went with the basic "reference" recipe from the book and used a mixture of Martell VS cognac and Smith and Cross Jamaican rum. 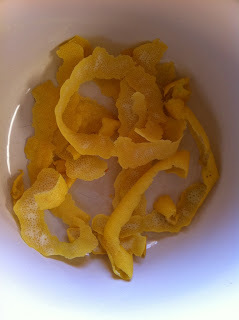 Step 1 Prepare the "Oleo-Saccharum"
Take a veggie peeler and carefully peel the skin from 3 lemons in long strips. Be sure to avoid as much of the white pith as possible, Save the lemons for juicing and put the peels into a large, non-reactive bowl. Add 6 oz of sugar. Use a muddler to mash the peels into the sugar until it is wet with lemon oil. Now let this rest for a minimum of 30 minutes. Give it an hour if you can. 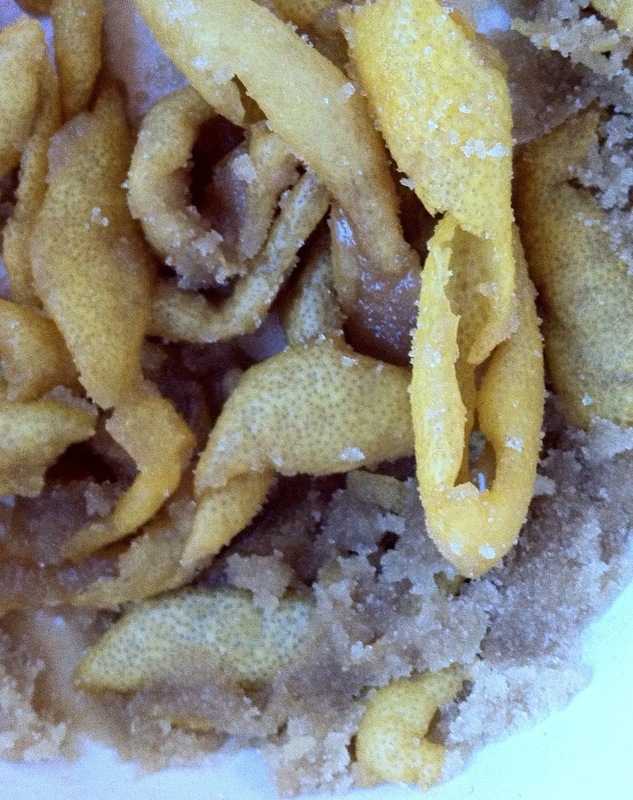 The sugar will continue to draw out the oils from the lemon peel. 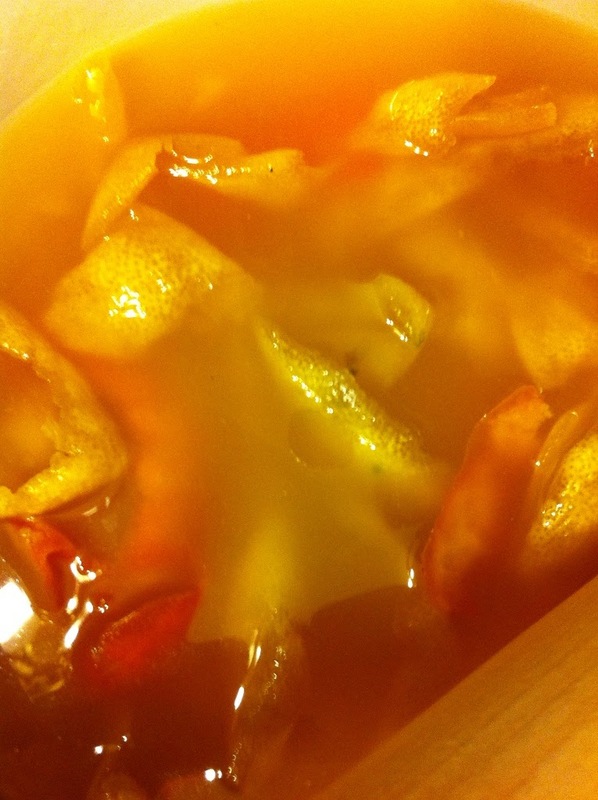 Juice the lemons and any additional necessary to get 6 oz of strained lemon juice and stir it into the oleo-sacchrum. 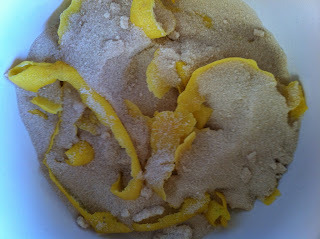 Side note: If you are using a rough sugar like a turbinado or demerara then add 6 oz of boiling water to the oleo-saccharum and muddle the sugar until mostly dissolved before adding your lemon juice. Stir it up and remove the peels with a slotted spoon. You can reserve the peels for garnishing the drinks or do what I did and decorate the ice for the punch bowl with it. Step 3 Adding the spirits and wines. 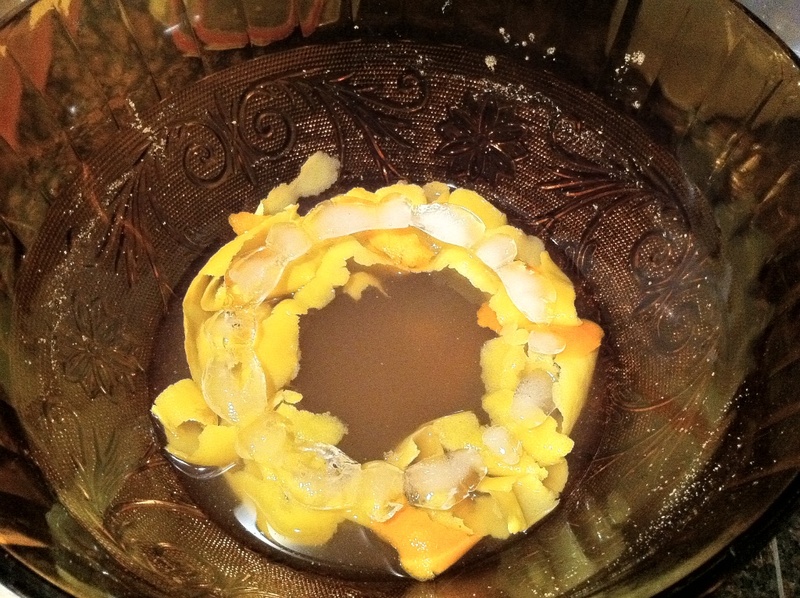 I went ahead and strained the shrub once more time after removing the lemon peels and before I added the spirits. Once you have a nice clear shrub, add 750 ml of spirits. You can use whatever you like, I went with the author's suggestion of 9 oz of Smith and Cross Jamaican rum and 16 oz of Martell VS cognac because it sounded so good. Stir, taste, you are now ready to bottle this up for transport or later use. The concentrated punch ready for bottling. Bowl, cups, bottles, nutmeg, ice - check! I'm ready to go. 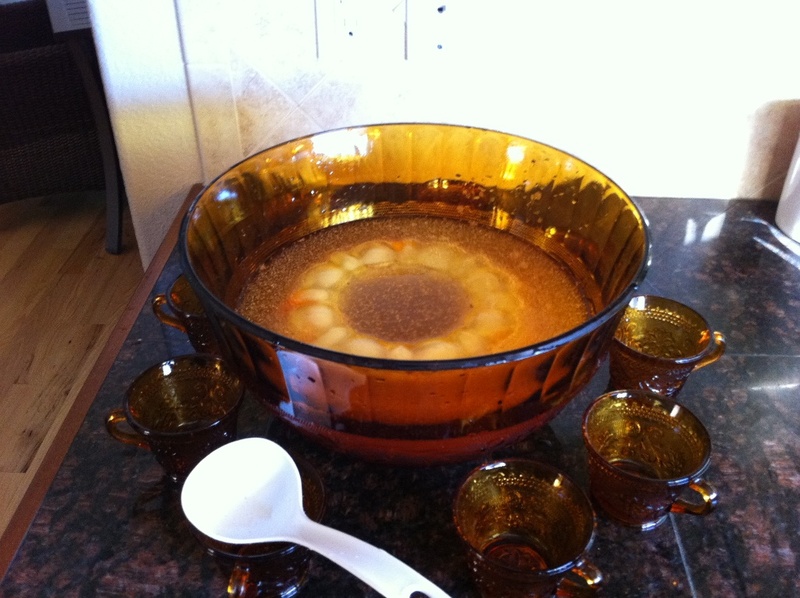 When you are ready, add the punch, 4.5 cups of cold water, your ice, and taste. If it's too strong, add more water. Grate a 1/4 to 1/2 of a whole nutmeg over the top. You are done, and no playing "bartender" all night either! The assembled punch ready to be enjoyed. As you can see, the punch was a hit! "Make that a double please!" 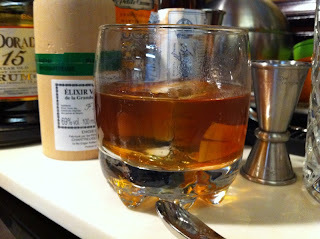 Simple and well balanced, the Tommy's is an elegant cocktail. If a well made Daiquiri is the benchmark drink to judge a rum by, this is the equivalent for tequila. 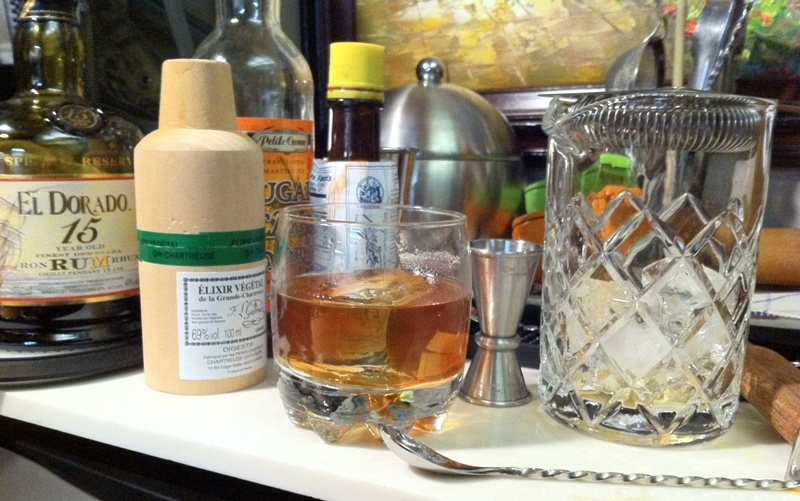 Shake with ice and strain into either a cocktail glass or old-fashioned glass with ice. If serving on the rocks, I like to strain the fine ice from the shaker. 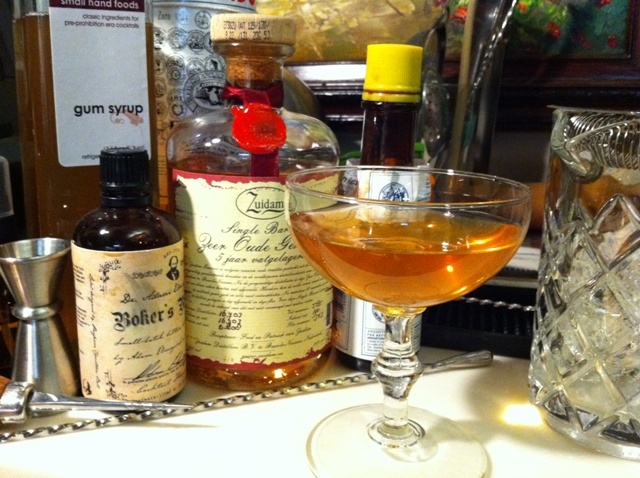 Here's a drink that was inspired by one served to me at the "Roomers" bar in Frankfurt Germany. They may be in a hotel with a cheesy name but that staff knows their stuff. They had just won the BCB (Bar Convent Berlin) award for best allround bar staff and it was a well deserved award. If you find youself in any bar in the world and find 2 people there that really know their stuff chances are you're in a rare spot. Three people, must be a special night right? Here not only were there at least 4 on staff with knowledge and talent but the manager knows his stuff too! The second night found me back again and their "star" bartender, that was nominated for Bartender of the Year at BCB, was greeting and taking coats once the evening VIP hours had begun, Teamwork and Humility. They all knew their stuff and no job was too small or large for any of them. I've not seen their equal anywhere else. (Late night the jiggers are set aside, the music pumps up and they all start free pouring!). This was one of the more memorable concoctions of the evening. They went to the El Dorado 15 often (they even had a speed pour on it for crying out loud!). Here's their Sazarac inspired drink, or at least my best approximation. Rinse glass with the 1/4 oz of Chartreuse Elixar Vegetal, add large cube and set aside. 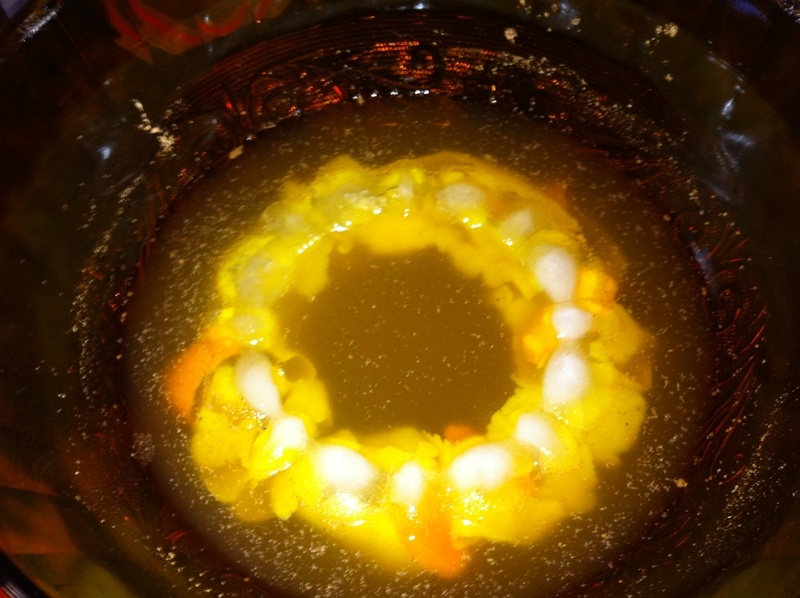 In a seperate mixing glass, combine remaining ingredients and mix well. Take thin slice of lemon and squeeze oils over top of drink. 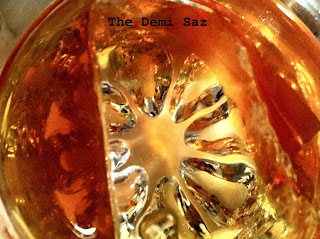 Rub the rim of the glass and drop into drink. 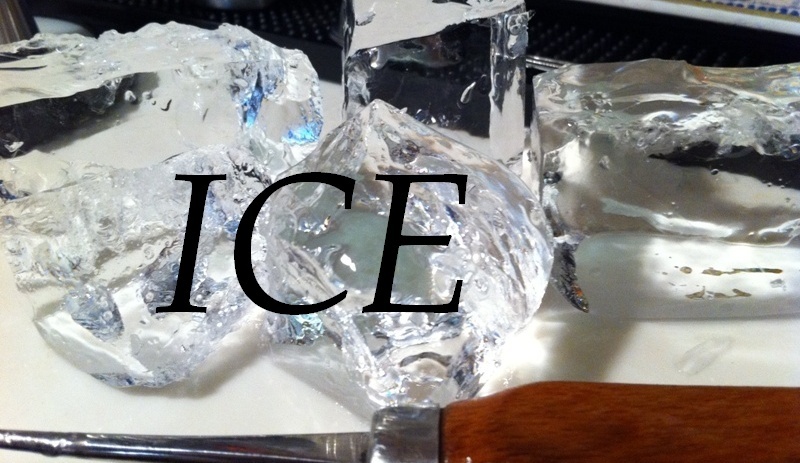 When it comes to cocktail esoterica, ice may be one of the most important (and overlooked) aspects of home cocktail making. So let's talk ice. In later postings I'll dig into professional-grade gear and how it can help you match that $15 cocktail experience of a world class bar at home at huge savings. High-end tools can make a difference but using good ingredients is most important. Using the right ice for the job is crucial. 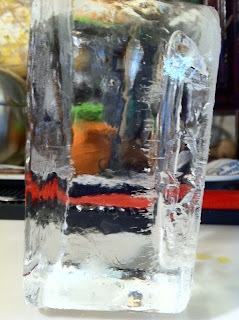 A large cube of any clarity will melt slower and keep your drink colder longer than regular sized cubes. When mixing (or shaking) it's important to have different sized pieces of ice so you get dilution of your drink while you chill, but not too much. Too little dilution and the drink becomes strong. 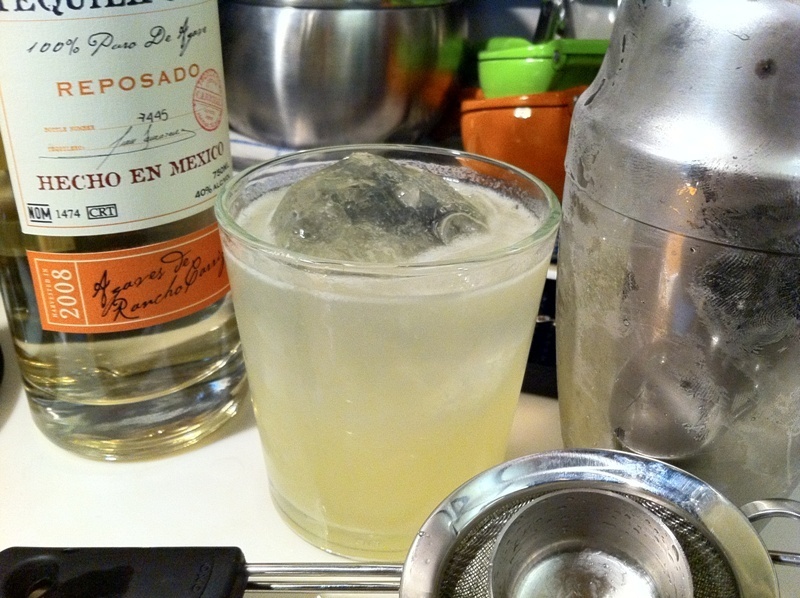 Without the addition of the "element" (water) many of the strong spirits used in cocktail making never fully open up to their true flavor potential. Too much dilution caused by small or warm cubes results in a pale, thin, watery imitation of your favorite bar's product. 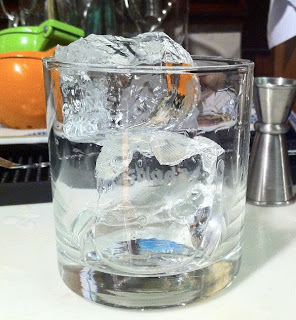 The ice melts so quickly that 5-10 minutes later you may not even have any ice left in your glass. If your favorite bar cracks their own ice by hand you may be used to diamond clear sparkling shards, squares or even spheres. 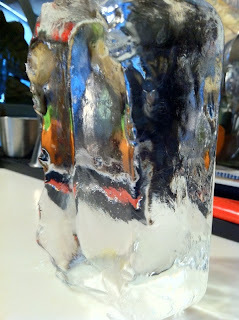 Sure chunky cloudy ice will keep your drink cold without over diluting but part of the authentic cocktail experience is the overall presentation and we're trying to duplicate that experience at home on the cheap right? So how do you get crystal clear ice for your home bar? Many of the top bars purchase 300 lb blocks of sculpture-grade ice made in sophisticated (and expensive) machines and carve them down into workable sizes for use in their bars. Not an easy thing to make use of at home. 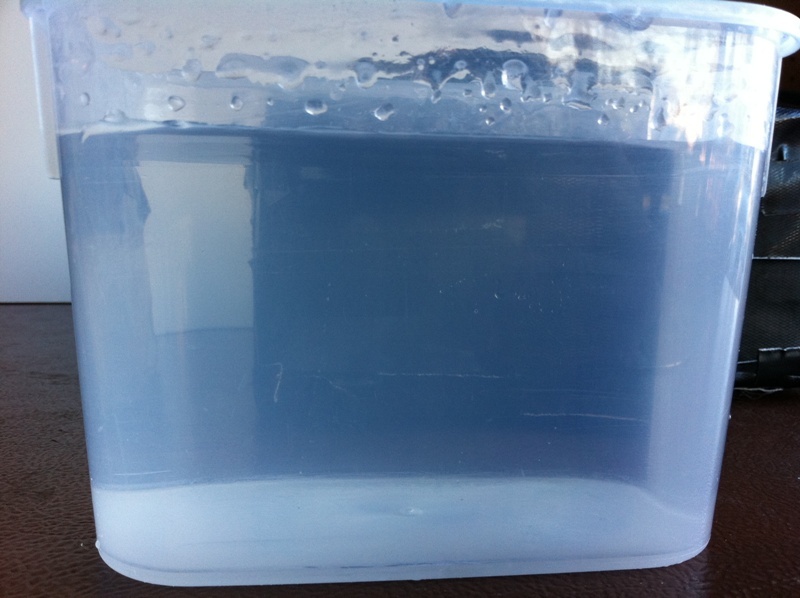 There is a lot of info out there on the hows and whys of getting clear ice. My technique is derived from Camper English's "Alcademics" blog. He has done some excellent experimenting and has found that insulating the sides and bottom of the form you are freezing ice in and allowing the ice to form from the top down can greatly improve the clarity of your ice block. 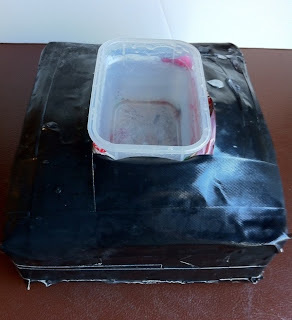 I started with a cardboard box filled with packing peanuts and plastic grocery bags and made a from around a tupperware type container and covered the whole thing in duct tape. Empty form insulated with plastic shopping bags and packing peanuts. 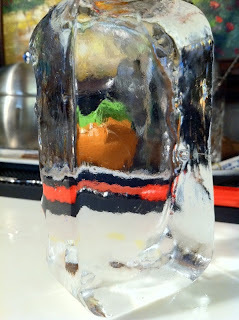 Now I can slip the container in and out easily to harvest the ice and re-fill. 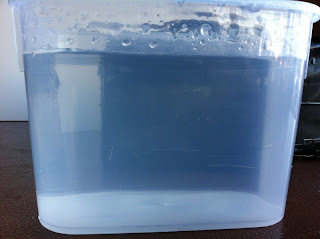 After experimenting with local spring water and tap water at different starting temperatures, I found that filling with hot tap water and checking after 10-12 hours produced the best results. Blocks half frozen with edges taken off. If your local tap water is not working for you or you just don't want to use it, try boiling the water first. Some even swear by the double boil method but try this as last resort. I've not tried it, but normal (non-mineral) bottles water or distilled water should yield good results as well. Bringing to boil and filling when only partially cooled should do the trick. 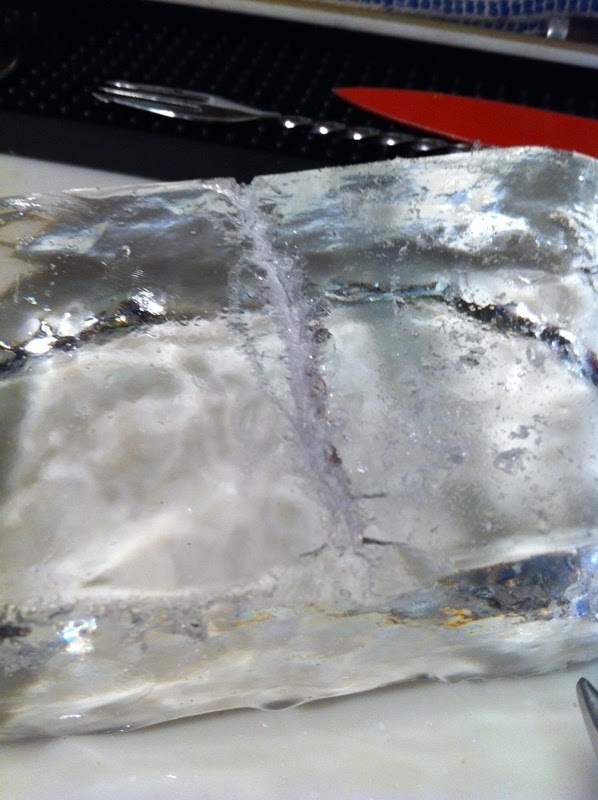 80% frozen with edges intact. 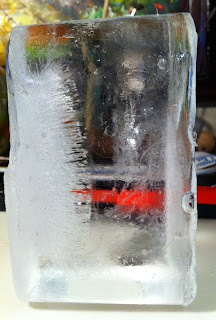 Caught before "impurities" froze and expanded. Hot water freezes faster than cold. 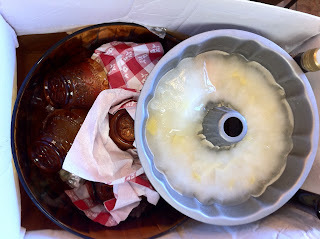 By freezing hot water in layers from the top, the impurities that freeze last fall to the bottom. If you allow the block to freeze solid you can see these impurities in the form of cloudy ice filled with air holes. 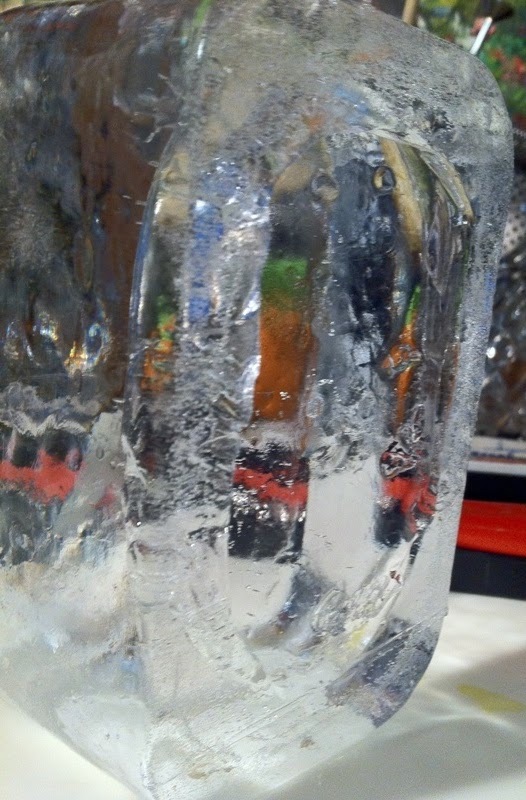 You can chip this part away to harvest the good clear ice on top (if you forget to check). 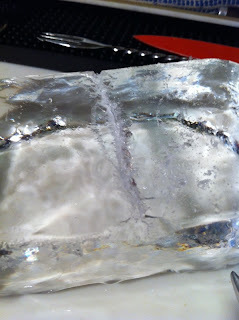 Often the air pockets that form will cause the ice to practically explode off the good block of clear ice. Fully frozen block with "cloudy" impurities at bottom. If you can catch the block before it freezes completely however all you have to do is let the unfrozen water at the bottom out and chip away at the sides and you are left with a very clear block of ice in a workable size. I can make 1-2 of these a day and store them away for future use. After a bit of playing around with the ice pick splitting these blocks into the shape you desire is easy and short work. 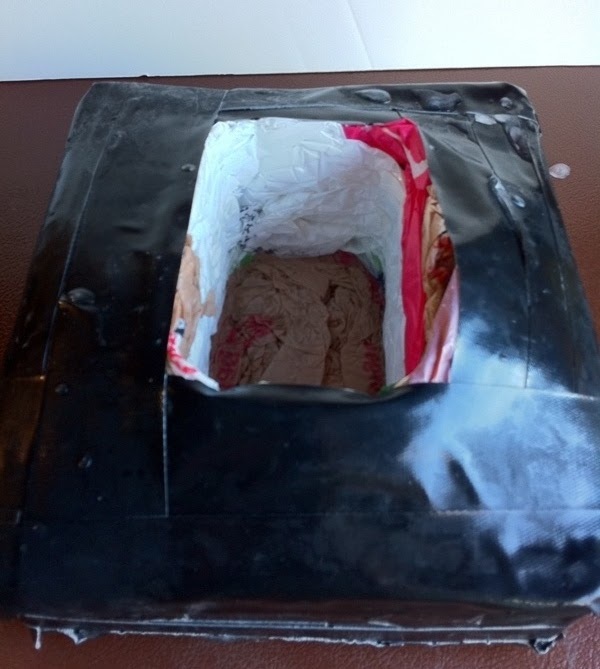 Ice scored and ready to crack. 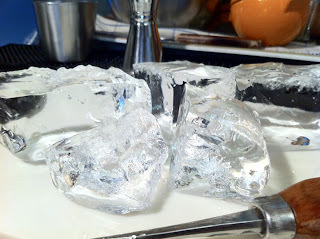 There you have it, clear blocks of ice for your home chipping pleasure! 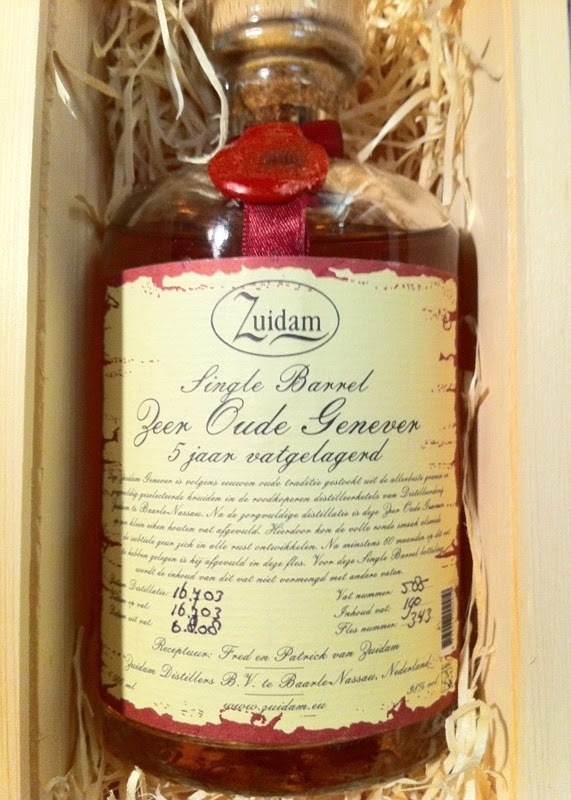 Today I received this bottle of Zuidam (pronounced Zoo-dam) as a gift so it seemed the perfect place to start. My experience with Genever (the Dutch word for juniper) ﻿in the oude style had been previously limited to the Bol's 6 y.o. expression. Genever comes mainly in 2 expressions, the "oude" (old) and "Jonge" (young) style which is not a matter of aging but rather of the technique of distillation and main ingredients used. The Bols 6 and the Zuidam 5 may both be oude Genevers but that seems to be where the similarities end. 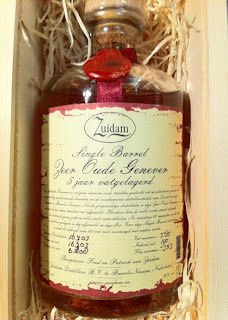 Where the Bols is clear and malty the Zuidam is amber and sweet. Indeed, it's very difficult to get past the malt nose on the Bols. In contrast the Zuidam has complex layers that bring you deeper and deeper into the glass. Clean citrus, vanilla, baking spices. Like a fine aged rum or cognac. The base is distilled three times in a pot still from Malted Barley, Rye and Corn. Coriander from Morocco, angelica root, juniper berries and iris root from Italy, licorice root from India, sweet oranges and whole lemons from Spain, and whole vanilla beans from Madagascar make up the nine botanicals that are distilled separately then blended back together to create many distinct layers of flavor. Fred van Zuidam and his son Patrick make up the father son distilling team that literally search the world over for the best natural ingredients available. The old world care and small batch aging in new (or very young) American white oak casks is evident. The "really silky smooth" mouth feel, rich vanilla and toffee notes bragged about on the manufacturer's website are present. A drop of mineral water and I'm transported to the tropics. This reminds me more of a "planter's best" (thanks for the new lingo Dave) style rhum than the thick, chewy malt and corn of the Bols. Clearly there must be as much range in the Genever family as any other spirit. Hopefully these catch on in the US! Since we're talking Genever in a premium, old style I thought the best cocktail test for this would be an "Improved Gin Cocktail" ala Jerry Thomas. Take 2 dashes Boker's (or Angostura) Bitters. twisted to express the oil. 1 small wine-glass of brandy (gin). peel in the glass and serve. 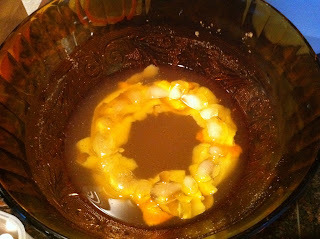 The flavor is improved by moistening the edge of the cocktail glass with a piece of lemon. Mix well in (a Yarai Japanese mixing glass from http://www.cocktailkingdom.com/ preferably of course!) 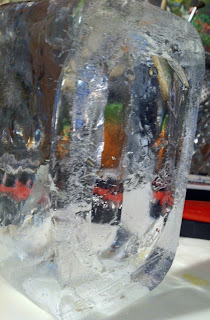 1/2 filled with hand-cracked ice. 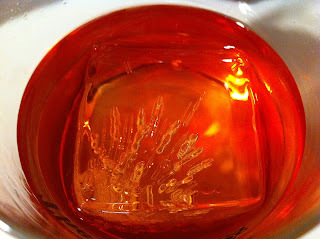 Strain into coupe cocktail glass. Zest lemon rind over top, rub rim and discard. Zuidam oude 5 "Improved Gin Cocktail"
Wow! Very different than Bols for this one. Don't get me wrong, I enjoy the Bols in this cocktail too. This new bottle tells me there's more to this whole Genever range though, and the "Improved" gin cocktail makes a great benchmark drink. This is a drink better enjoyed through direct experience rather than listening to my clumsy tasting notes, but if pressed I'd describe this cocktail as soft and sweet with good balance and depth. The maraschino and absinthe survive surprisingly well and support rather than overpower the Genever. 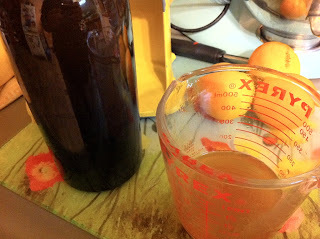 The lemon oils gives nice clean lift, and pull what could be a sweet cloying taste up to a more refreshing balance. The prof comes through again. Thank you Jerry!